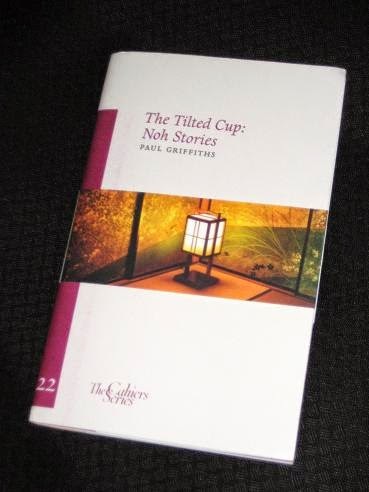 Paul Griffith’s The Tilted Cup: Noh Stories (review copy courtesy of the publisher) is another of the wonderful slices of writing from The Cahiers Series, a coproduction between Sylph Editions and The Center for Writers & Translators at the American University of Paris. Each of the cahiers is a slim, aesthetically-pleasing volume, running to about forty pages, and they all have some sort of connection with translation. This particular cahier is of special interest to J-Lit fans as it takes classic stories from Japanese Noh plays (slow productions which use wooden masks to convey emotions) and condenses them into brief, elegant short stories in English. While it sounds a little unorthodox, it’s actually a decision which works very well, as the original stories are less complete tales than thought-provoking vignettes – and they are all very well-known in Japan, on a par with such tales as the Arthurian legends or Aesop’s fables. Another theme is the occurrence of chance meetings, as detailed in ‘Hachi no Ki’. In this story, a ruined, exiled nobleman decides to show pity on a traveller on a cold winter night, and while the outcome is perhaps the most predictable of all the stories, it’s still elegantly done. In contrast, ‘Hanjo’ tells of a chance meeting between two young lovers, where fortune conspires to put obstacles in the path of their happiness, leaving the woman to abandon hope of ever finding the man again. “Thereupon a messenger in court uniform arrived to tell him the emperor had died, and had named him heir. What stands out most about the collection, however is the way in which several of the tales play with the structure to make the story stand out. In ‘Fujisan’, the brief text is shaped in the image of the famous mountain, and ‘Teika’, which recounts the perfect love between a princess and a poet, takes the form of an incomplete sentence, one which circles back on itself and could almost be read continuously.